... I thought we used to have a thread, but couldn't find one using search? So I thought it might be useful to have a dedicated thread like the one for the UK. ANYhoo... very excited for the Tenno Sho Autumn (G1) today!!! So many of my favorite runners I don't know who to root for. It's been raining steadily in Tokyo with a typhoon approaching. 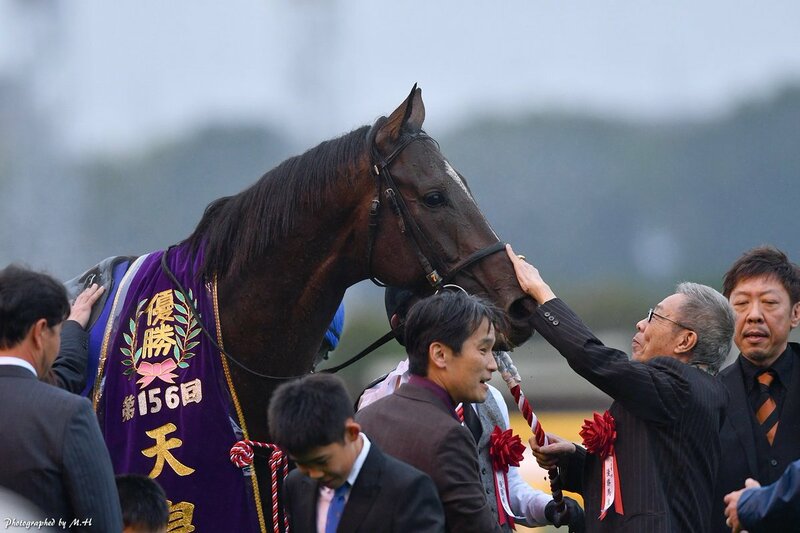 The Tenno Sho Autumn today will be run on the turf labelled 'soft' for the first time since 1991 when the first place finisher Mejiro McQueen(JPN) was disqualified and demoted to last. I wonder if the horses who can race upfront will have good shots unless someone sets a killing pace. Last edited by tachyon on Sat Oct 28, 2017 10:41 pm, edited 1 time in total. I wonder how some of them will handle the soft turf... looking forward to an excellent race! Only a few hours left to wait. IIRC, Kitasan Black is quite capable of going to the front and staying there. I watched the 1991 replay as I had not seen Mejiro McQueen actually race... I saw in the post-race inquiry that he came over a little bit, but surely not enough to be placed LAST??? The inside horse with the blaze came out at the same time and seemed to me to contribute far more to the pinch & pile-up (which was very scary, I'm glad nobody went down! ), but it was Mejiro McQueen who was disqualified?? I'm watching the races on TVG and, damm, the weather is bad. Maybe that typhoon made landfall? When Kiseki won the Japanese St. Leger, I thought the rain was so heavy that, IMHO, an American track might have held up its races. Japanese horses...and jockeys...are tough. And good swimmers. After all the undercard races, with large fields tearing up huge clods out of the turf course, it may not be easy to find even ground to run on...that doesn't have a bunch of holes collecting water. Holy crap Kitasan Black looks like he's in beast form in the paddock. WOW. Satono Crown looks cranky... Real Steel all business. Soul Stirring up on her toes but not fractious. Neorealism looks good, not so sure Satono Crown wants to run today. Think I will go with Kitasan Black, Neorealism & Soul Stirring for my three. And of course just want them all to come home safely. Well, that was brutal, but Kitasan Black showed every bit of his class to hold off the 2nd horse, who I think was Satono Crown. His rider may have made the winning move by bringing KB up the rail, which everyone else was avoiding. The ground he saved may have made the difference. omfg I can't believe it the Dubai Racing stream (which is abt 10 minutes delay) cut out JUST AS THEY WERE GOING TO THE GATE. 2016 HOTY Kitasan Black was always Kitasan Black!! Yutaka Take gave him the best ride, too. Kitasan Balck became the second richest racehorse in the Japanese racing history following TM Opera O. Thanks for the replay, tachyon! Looks like both Yutaka Take & Mirco Demuro benefited from stalking up the rail... what a great finish! I think Mr Black knew *exactly* where the finish was. Watching him on the trot back, with ears pricked & looking around, you could tell he knew he'd won. lurkey mclurker wrote: I watched the 1991 replay as I had not seen Mejiro McQueen actually race... I saw in the post-race inquiry that he came over a little bit, but surely not enough to be placed LAST??? The inside horse with the blaze came out at the same time and seemed to me to contribute far more to the pinch & pile-up (which was very scary, I'm glad nobody went down! ), but it was Mejiro McQueen who was disqualified?? That was remembered by the Japanese fans as one of the most controversial decisions ever made by the JRA stewards. Mejiro McQueen became the first horse in JRA history to be disqualified from the first place in G1 events. Personally I don't disagree with the final decision in the 1991 Tenno Sho Autumn. Yutaka Take could have been a bit more careful as he rushd into the first corner from the outside post especially riding at 2000m turf at Tokyo Course whose lead-up straight to the first corner was unusually short. We may also conclude that it was rather JRA's fault who ran the important G1 at a course with such a risky setting. After that incident in 1991, Tokyo Course has been renovated and its 2000m turf course now has a little bit longer lead-up before the first corner. But it remains a very difficult run for the jockeys. Tokyo Course has sometimes been compared to the Belmont Park Course. But I believe that Tokyo's 2000m turf's start remains more dangerous than the Belmont's 10F dirt start. Getting excited about the potential field of fillies & mares for next week's G1 QEII Cup! The four-time GSW gets Ryan Moore in quest for her first victory at the highest level. I didn't look if someone already posted a link to this documentary. It's really worth watching! From breeding to racing, to the organization, showcasing the greatest japanese Thoroughbreds... was wonderful to watch.